Took a trip to San Diego the other weekend and my very first stop was Extraordinary Desserts and like the name says, it was far from ordinary! 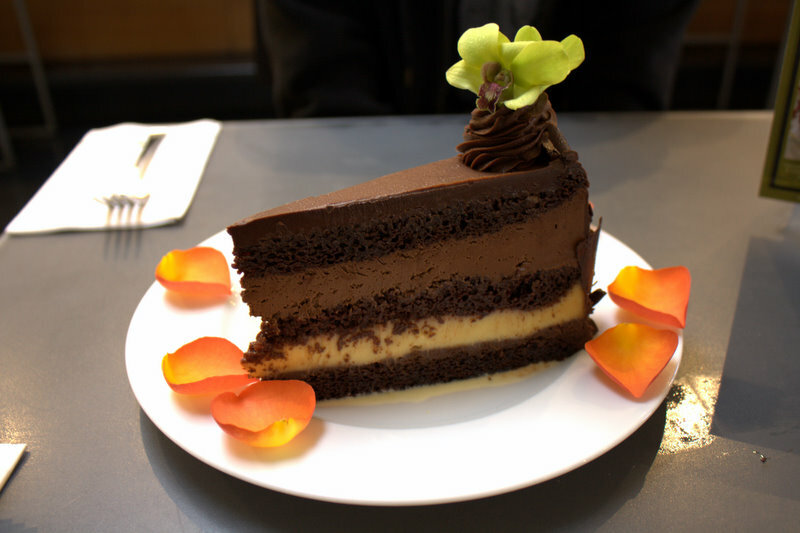 I heard about Extraordinary Desserts from friends before, but I never thought to visit it sooner and now I wish I had. When you walk through the door you just see a long display cases filled with beautifully decorated cakes and treats. 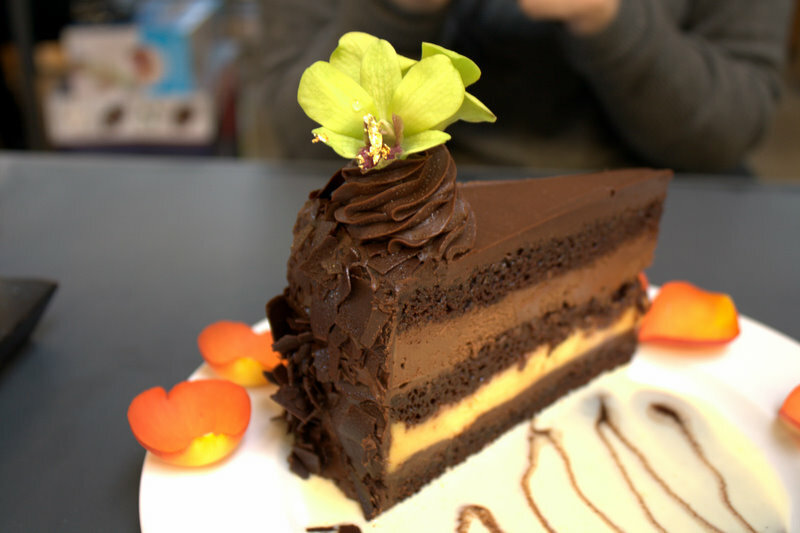 Fresh flowers were adorned on almost every dessert, which seems to be their signature style. I had to take multiple trips up and down the display just to wrap my mind around everything I was looking at and try to narrow down my choices. I finally settled on the La Bete Noire cake (Traditional vanilla crème brûlée, chocolate truffle cream are layered in between dark chocolate cakes and moistened with Madagascar vanilla bean). It was absolutely decadent and the creme brulee layer was my favorite part, such a brilliant idea. 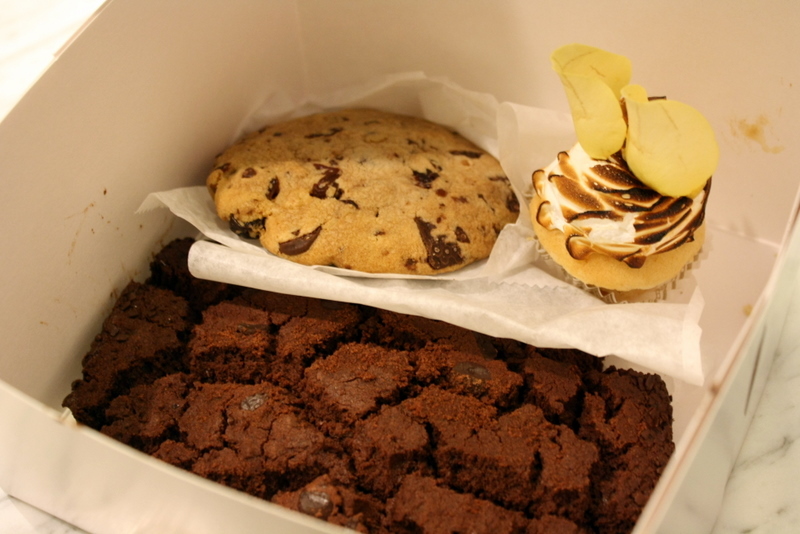 Of course, I couldn’t leave without taking a few things to go: cherry chocolate chip cookie – not my favorite, Chocolate Chunk Shortbread- very chocolately and oh so yummy, Mini Lemon Meringue – perfect size for a small treat and a lovely lemon flavor, not too tart. I was dissapointed that they weren’t offering their famous Chocolate Crossiant Bread Pudding, but that’s ok because it just gives me another excuse to visit. 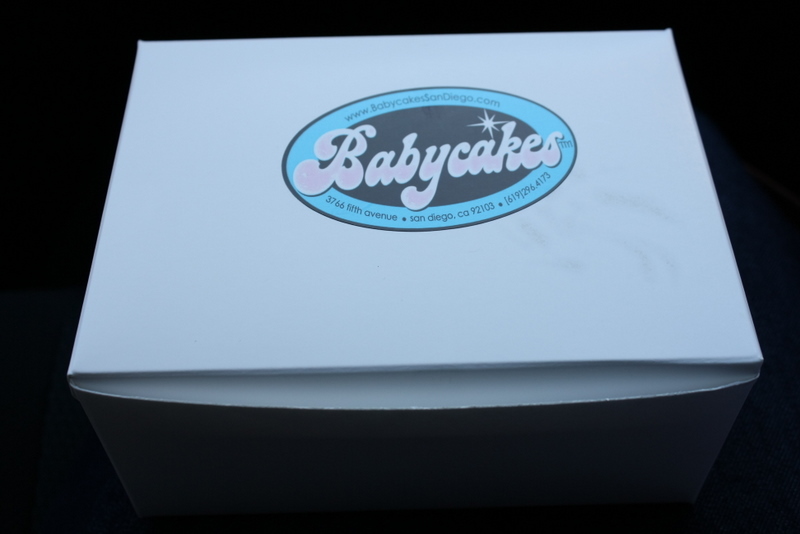 I made one more dessert stop on my trip and that was to Babycakes. It got decent reviews on Yelp, so I decided to check it out. They had a unique selection of cupcake flavors ranging from PB&J to Guava cucpakes. 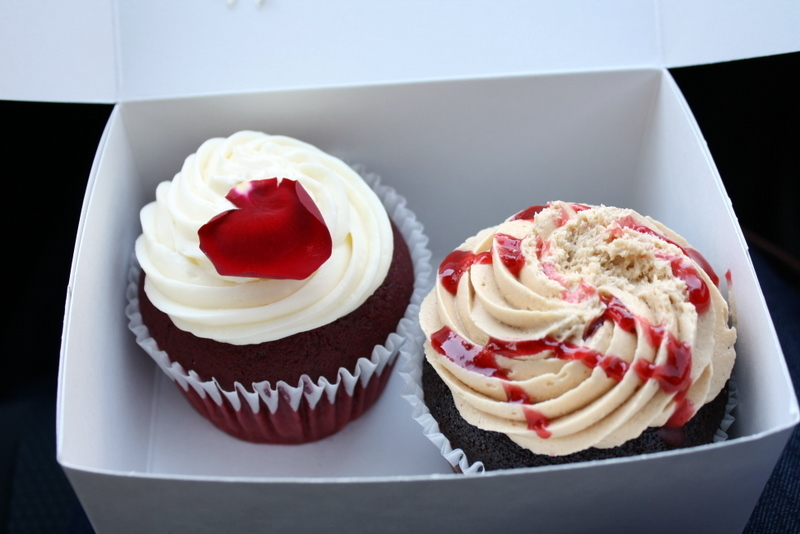 I decided on the Red Velvet and PB&J. The red velvet was a complete fail. I don’t know if maybe I got an old cupcake, but it was just super dense and flavorless. Sadly, I ate a part of it and just threw the rest away. Not worth the calories. The PB&J was much better and salvaged my trip to Babycakes. The peanut butter frosting was delicious and I loved the jam syrup drizzled on top. The cake was just a plain chocolate cake, nothing fancy, but at least it wasn’t as dense. Overall, the trip was great and I’m happy that I found a new favorite dessert place, Extraordinary Desserts. 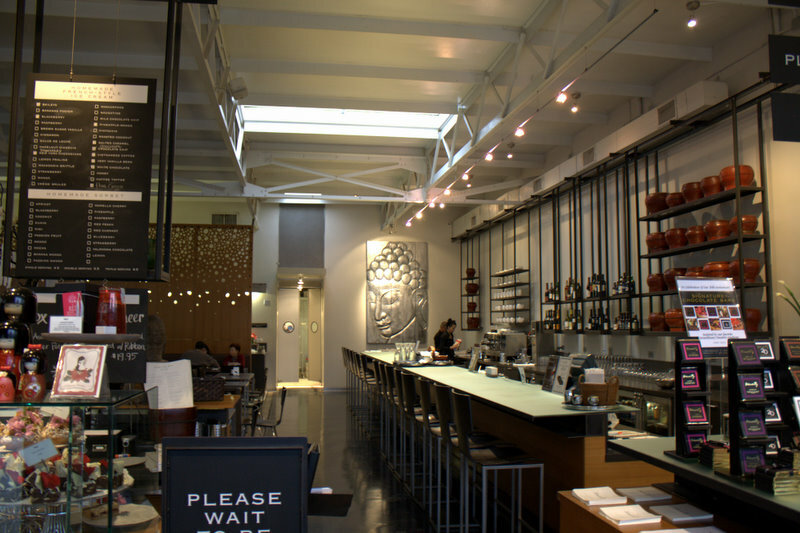 Hopefully, they will decided to open a store in LA in the future! My Goodie Box - The shortbread was huge! Defnitely worth it!